What if you could “pick up” an idea or problem, see it one way, rotate it a quarter-turn, see it another way, rotate it a quarter-turn, see it another way, and so on. At first this seemed woo-woo to me, like yoga and meditation. But now that I’ve incorporated those things into my life it’s only fitting to add mental models. And what I’m learning is that when you only see things one way it’s self-limiting. You apply the same solution over and over again. But knowing a set of mental models opens up a broad set of solutions you can draw from. And the best way to learn these? You guessed it: reading. 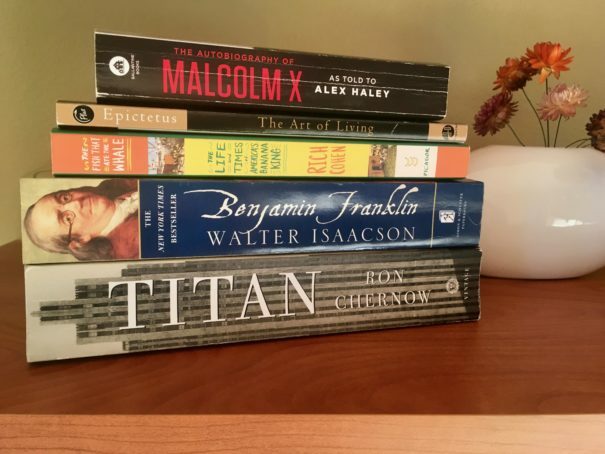 I’ll admit in the past my reading was pretty narrow — mostly books on investing and productivity — so this year I wanted to read more broadly, and I thought what better way than with biographies and autobiographies? It turns out they were a gold mine. Because not only do other people have wildly different life experiences, they approach problems with wildly different solutions. Here’s the top five I read. I’ll admit that I didn’t know much about Malcolm X when I bought this book, but I’m glad I read it after a friend urged me to. Malcolm X was born into adversity, becomes a criminal, goes to prison, completely re-makes himself by spending all his time in prison reading books (even the dictionary), finds religion, and then becomes a civil rights leader before being gunned down by his former supporters. The bigger lesson I came away with was the importance of being self-reliant. That you don’t have to conform to how everyone says you should act and think and look. That you can follow your own ideas and instincts, and live a life true to yourself. I read Meditations by the Roman emperor Marcus Aurelius, and I wanted to recommend that book because it’s the most popular one on Stoic philosophy. Maybe it was the translation by George Long, but I found Meditations to be a tough read. On the other had, The Art of Living is more accessible. A reader recommended it, and then I saw a copy on a friend’s coffee table. Once I picked it up I couldn’t put it down. Clocking in at 100 pages or so, this book has the most wisdom packed into the least amount of space, and it’s the book I read a few pages from almost every morning. The story about Sam Zemurray was so compelling I finished this book in one day. It’s a true rags to riches story: A poor Russian immigrant peddling ripe bananas to becoming one of the richest and most powerful men in the world. There’s tons of lessons in business strategy and leadership here. For example, when the Honduran government stood up to Zemurray he simply changed out the Honduran government. Or when a competitor wouldn’t let him build a bridge across a river he built long piers from each bank and put a raft in-between connecting them. Towards the end of his life he started coming to grips with the repercussions of building his banana empire at all costs, and this caused him to focus on charitable giving. This was a good reminder to give back, because life’s not all about being the richest person in the graveyard. I was surprised to learn Benjamin Franklin was thrifty. He was pretty vocal about it, plus working hard and being self-reliant. When you combine all three it’s what lead to him becoming wealthy, and it’s hard to argue those aren’t the same traits used today. There’s tons of lessons about business in this book. Most impressive was the vertical media empire he built from scratch: He owned a printing press, publishing house, newspaper, almanac, and had control of the postal system. It’s the modern-day equivalent of a “platform”. I was apprehensive to read a 676 page biography about someone I didn’t know much about. But this book was packed with so many lessons about business and life that I can see myself reading it multiple times. When Rockefeller was a boy he once spent three days digging potatoes for 37.5 cents a day. Soon afterward he loaned a farmer $50 at 7% interest, collecting $3.50 at the end of the year. Without doing any work. That taught him to let money be his slave rather than being a slave to money. And as he became the richest man on the planet by building Standard Oil he still reviewed every bill that came to the house, and patrolled the hallways turning off lights. This wasn’t because he was stingy, it was because he valued and respected money.